Today an anti-virus alone is not enough to protect a PC. All the Dr.Web for Windows protection components are available in Dr.Web Security Space. Neutralisation of ransomware lockers — unique to Dr.Web! Today an anti-virus alone is not enough to protect an Android device. 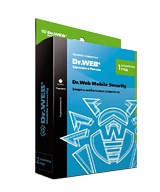 All of Dr.Web for Android's protection components are included in Dr.Web Security Space.